One morning an elderly man was walking on a nearly deserted beach after a big storm had washed up thousands and thousands of starfish. He came upon a boy who was picking them up and throwing them back into the ocean, as eagerly as he could. As you might expect, the spectacle in Reno, has cost me some sleep. The WPI has fallen on its own sword in an agonizing display of poor judgement. Such a waste of promising research, money, energy, goodwill. Doors shutting tight all over the place. Tragic beyond belief. Judy Mikovits is my friend. I still do not know the details of what happened, as she is prevented from discussing the case by her attorneys. But whatever she did or didn’t do with respect to the events since her firing, it is safe to say that she in no way deserves what is happening to her now. On this point, John Coffin and I agree. It is all well and good to say that now that XMRV is dead, science can get back to its orderly, stepwise process; they even get to say, we told you so. And I say what I have said all along: millions of patients need treatment now. It is not a static situation. It is a progressive disease, slow, but lots of people are circling the drain. Many new cases that might be easier to treat sooner rather than later… that might respond more completely to arv’s. New babies being born with it. Should we wait a decade to start to find out, in a systematic way, if existing treatments might not affect it? It is incumbent upon the medical and pharmaceutical industries to think about the disease in concept and find solutions, not sit there doing nothing until Virus X is found; that approach already hasn’t worked for decades. It is quite likely that it won’t turn out to be a one virus, one disease, one treatment paradigm. If it were that simple, it would have been found already. So I find myself sitting with real patients, in the here and now, framing the illness as I have outlined here over the last year and a half. I still find the model we are evolving useful in a clinical context. In my last practice, my interest was peak performance with respect to brain function, no matter the degree of injury or illness. I worked with the things that I found useful, personally and for my patients, most of whom had already exhausted their medical options. I was undiagnosed at that time. I knew I was sick, but it wasn’t too bad, and I knew that conventional medicine had nothing to offer me. It occurred to me now and then that I had some sort of less than MS. Other possibilities occurred as well. I tried to fit it into PTSD, but there were too many physical manifestations, hypertensive crises, arrhythmias, atypical migraines, malaise, this or that instability. I could exercise without problems for a decade. I used to say that whenever something went wrong with my body, it was undiagnosable. And I was CFIDS aware. That state of not knowing made me well suited to being a doctor of last resort. My armamentarium then was HBOT, neurofeedback, nootropics (cognitive enhancers), nutraceuticals, herbs and bioidentical hormones. I found discontinuing unnecessary drugs to be a powerful treatment modality. And I tried to create the space for the less tangible, but no less powerful healing that can happen in the context of connection and relationship. So far, I am using pretty much the same gentle, yet powerful modalities that I used before, when I didn’t know what I was doing:), and I’m having some beginner’s luck. I am turning to these treatments first, because I know from experience, they work, and now I have a framework that gives me a better idea why. Pulsed, high dose normobaric oxygen is the most powerful and easy to deliver treatment that I have to offer. My patients so far are pretty uniformly impressed. Nobody that has rented a concentrator for a month has returned it, unless to buy one. Responses range from a little helpful to “wow”. There is a short term effect and a long-term additive effect, as I observed with HBOT in practice. It seems one of the craziest things in all this that such a simple thing has been denied us. I wonder about why, and can’t come up with much. It will never be studied, because it can’t be patented. It might accelerate aging, but the longevity folks think it’s the opposite. It needs to be more carefully dosed for patients with seizures and a few other things. Mostly, it’s probably because doctors don’t understand the gas laws, and so are uncomfortable with it. They can handle it when it comes out of a wall in a hospital, where it’s use is sanctioned, and there’s a respiratory therapist to hook things up. Otherwise, if you have COPD or are dying, you can have it. Sometimes insurance will cover it for cluster headaches, or migraines, common in our patient group. I am prescribing oxygen, for an hour a day and prn, at 10L/min by non-rebreather mask (has a reservoir and check valves), or 5-6L/min by simple mask for patients who bought lower flow concentrators (two are improving with this). Here are a couple of references that address the oxygen paradox: Why might high dose oxygen be good for us, even though we have increased oxidative stress at baseline? Oxidative stress, antioxidant defenses, and damage removal, repair, and replacement systems. Davies: Cells, tissues, organs, and organisms utilize multiple layers of antioxidant defenses and damage removal, and replacement or repair systems in order to cope with the remaining stress and damage that oxygen engenders. The enzymes comprising many of these protective systems are inducible under conditions of oxidative stress adaptation, in which the expression of over 40 mammalian genes is upregulated. HIV: reactive oxygen species, enveloped viruses and hyperbaric oxygen. Baugh: ROIs repeatedly have been shown to be virucidal against enveloped-viruses, like the human immunodeficiency virus (HIV). Hyperbaric oxygen therapy (HBOT) increases the production of ROIs throughout the body, leaving no safe harbor for the virus to hide outside the genome. This technique already has been tried on acquired immune deficiency syndrome (AIDS) patients, with exciting results. As I am finishing my first six months of practice, Ali is coming into her own, with great courage. She has enrolled for an online undergraduate program at U Mass, and will start next month. She has been dating, but still mostly staying home rather than venturing out. Right now, she is deep in the process of confronting that she is probably physically able to do more things away from home, but confined by habit and the limitations of the past. It is hugely more difficult for her than for me to emerge, without a former life to go back to. Ali credits oxygen and modified Meyer’s cocktail infusions with her slow but continued improvement. She tells me when she feels the need for an infusion. We are still tinkering with the best formula for her. She uses oxygen 4-5 times a week, according to her own instincts. She has come to use it prophylactically for PEM, when she knows she’s overdone it. It is impossible to know what role antiretrovirals are playing in maintaining her gradual improvement which began with the cessation of Lyme treatment and was also obviously impacted by Deplin and treatment for PCOS (polycystic ovarian syndrome). Our concentrator has been broken for a couple of weeks and when the replacement came, she grabbed the mask, exclaiming “Oxygen! Mana of the Gods.” For me too, oxygen is the most tangible thing I have. It impacts my sleep directly. I asked Ali if she’d like to write something for the blog, and she said it has become too contentious for her to want to risk it. However, she said that if she was going to write, it would be about the things that she has gained from her illness. The silver lining. The wisdom that comes from living life with the toughest teacher always at your side. For one so young, she has become really good at making lemonade. I am very proud of her. The markers we chose to follow when we started arv’s, beyond what was going to be monitored at the WPI (NK cells and cytokines), were TGF beta-1 and C4a. Ali’s were normal when checked a couple of months ago. The specimens require special handling, several were lost for both of us in 2011, as often happens with esoteric tests; we weren’t motivated to go in for redraws, since they didn’t seem exciting in terms of guiding treatment, and weren’t needed for safety. Ali had no subjective inflammatory flare when she went on arv’s, but most who have tried them, did, usually 6 weeks or so, shorter for tenofovir. 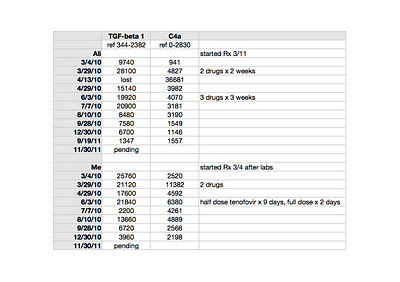 Ali’s numbers actually look like she did flare, though clinically she felt she was improving. My impression while I was watching these labs come in was that they were lagging behind the clinical picture. It looks like I flared in August 2010 and interestingly, I was about to leave for my first trip to Reno, first trip anywhere in years, when those were drawn. TGF beta-1 is a peptide involved in many cellular functions, including the control of cell growth, proliferation, differentiation and apoptosis. Here is a recent paper suggesting TGF beta-1 as a marker for CFS: Up-regulation of TGF-β1 mRNA expression in peripheral blood mononuclear cells of patients with chronic fatigue syndrome. Zhang. It is tempting to speculate that TGF beta-1 could be involved in the clonal expansion we are starting to think about with respect to the pathogenesis of ME/CFS and related leukemias; not forgetting that simple animal retroviruses replicate mitotically, by clonal expansion. TGF beta-1 is implicated in the pathogenesis of Marfan’s Syndrome, which my husband’s uncle, husband and son have; in our family it appears to be more obviously expressed in each successive generation. Elevated TGF beta-1 is implicated in the pathophysiology of Marfan’s. My husband and I both had different, subclinical manifestations of illness when we met, but most, though not all, of his were attributable to Marfan’s. Marfan’s is an autosomal dominant genetic condition where chromosome 15 encodes for a defective protein which is necessary to bind TGF beta-1 to keep it sequestered to normal levels (oversimplified model). Losartan, an ARB (angiotensin receptor blocker) has been shown in clinical trials of Marfan’s patients to lower TGF beta-1 and slow the onset of the most serious consequence of the disease, aortic root dilatation. My biological father had a body habitus consistent with Marfan’s and I may be an Ehlers Danlos variant, becoming more flexible with age and exacerbations of illness. I have minor features of both conditions. Both Marfan’s and Ehlers Danlos seem to be over-expressed in the ME/CFS patient group, already showing up in my tiny practice. Here is an excellent article which considers related disorders with respect to abnormal TGF beta-1 signaling: Transforming growth factor-beta signaling in thoracic aortic aneurysm development: a paradox in pathogenesis. Jones/Ikonomidis. A couple of weeks ago, I discontinued Actos for worsening dependent edema, mild, but not clearing overnight. The edema went away when I stopped the drug, but everything else flared. So it would appear that Actos was helping, but hurting too, as is often the case with pharmaceuticals. This little setback is making me take a look at my do as I say, not as I do tendencies. There are things I can do to help myself that I’m not doing, mostly having to do with consistency. So, my pre-New Year’s resolution is to be more compliant with my own program, including pacing mental exertion, the hardest for me to accept the necessity for. Of course the most potent triggers are the ones we have no control over, though the response to one’s predicament is always a choice. >@Anon 9:32AM, there definitely is a genetic component to autism, a panel of genetic tests can now pick up somewhere in the range of 15-20% of cases, this may go as high as 30% in the next few years as research on new markers is added. That is in contrast to 0% validation to date for a retroviral link, despite what the crazies at Age of Autism try to claim. Studies looking at autism and RVs are not published yet, so you can claim anything about validation in relation to this. >Why is everything again being repeated over and over again? And if something is said that is absurd, ignore it. The same points are very repetitive, and not bringing anything new to the discussion. Ignore ridiculous points and move on. They have been answered. Don't rise to being perturbed and commenting again. It's going around in circles. New information is appreciated, not repetition. I agree, but repetition of information in different ways can help people to understand the issues when other are creating confusion through lies and misinformation. >Not over and over again, sometimes 100s of times. It makes people's eyes glaze over and they just skip reading something. "You are still avoiding the question. What do you think they are optimising to when they use a known positive?" I haven't answered it because it is a nonsensical question. You can calibrate your assay TO something, but you do not optimize your assay TO something. When a lab uses VP62 to optimize their assay, it doesn't mean the assay is optimized TO VP62. temperatures). Having a (serially diluted) VP62 sample as control, will then help you to check if you have not given up too much sensitivy. When you have increased your specificity as much as possible without giving up a (weak but reproducible) positive signal on VP62 (which, regardless of what you think about its relevance, should still be amplified by all known "HGRV" primers used by Mikovits, Lo, etc), you have optimized your assay for specificity using VP62, but you have not calibrated your assay TO VP62. Using VP62 is perfectly acceptable. You have just implanted this silly idea in your mind and this enables you to disregard all past and future findings you don't like. I can only hope you don't contaminate too many others with this nonsense. VP62 is man made and has never been detected by anyone in nature. It cannot mimic the real life conditions of a wild-type virus. This is in vitro not in vivo. VP62 was not what they discovered in Lombardi et al. They found other variants of MRVs. So assay optimised to VP62 is not capable of detecting MRVs. All they be looking for is VP62 variants, optimised to synthetic virus conditions. Do you disagree with what adustymiller said? "It is true that the PCR assays can only reliably detect viruses containing nearly exact copies of the sequences present in the PCR primers, and thus may not detect some retroviruses more distantly related to XMRV." All VP62 studies can now be retracted. >Optimising an assay means adjusting the variables to give optimum sensitivity. Doing this to a synthetic virus under artificial conditions will mean using different variables than for a wild-type virus. Change the idependent variables and you change the dependent variable. "Do you disagree with what adustymiller said?" No. Like I explained before, that Miller quote perfectly SUPPORTS what I wrote. Note that Miller states that the PRIMERS (mostly) determine the detection range and not the optimization process. Thus, scientists that have used the same primers sets as Mikovits/Lo/Urisman, should have detected the same H/Z/X-MRV viruses if they were there. "All VP62 studies can now be retracted." The rest of your post is even more nonsensical. It doesn't matter if VP62 was man made and/or cannot "mimic" real life conditions. If you spike VP62 into blood, the (e.g.) Urisman gag primer sets should amplify it. If it doesn't amplify VP62, either you have messed up your experiment or your sensitivy is too low. The miller quote supports nothing you have said. The viruses are not VP62. Primers are a part of an optimisation process, but only one of several variables. Name who has used the same primers as Mikoivts/Ruscetti and what the other variables they changed for those assays? There has been no replication attempt. Your standard of retraction is when a paper is wrong. Those papers never looked for the viruses found, ie they are wrong and can be retracted. "If you spike VP62 into blood, the (e.g.) Urisman gag primer sets should amplify it. " Amplify what? VP62 is synthetic, no one found it. >You optimise your PCR assay for the task in hand. You adjust the variables of the assay, notably magnesium and the annealing temperatures, untill the assay is able to detect a low copy number of the target sequence commonly in a spiked sample of human DNA thereby determining the analytical sensitivity or theoretical limit of detection. The next step is to see if the assay can detect the target in in vivo conditions in a sample taken from a person known to be infected. This is called determining the clinical or diagnostic sensitivity of an assay. Sometimes the assay does not need to have any parameters adjusted but often that is not the case. Without this second step an assay will not be given a licence for any diagnostic purposes and using such an assay in a diagnostic setting would be unlawful and illegal. RRM, how do you think you optimise a PCR assay to detect a target sequence in a person known to be infected using tissue sampling? "The miller quote supports nothing you have said." It does, actually. You are just making stuff up around the Miller quote. Fact is that Miller explicitly stated that your PRIMERS essentially define and limit what sequences you are searching for, and that a small difference between the sequences the PRIMERS target and the actual sequences themselves, can lead to false negativity due to TOO STRINGENT PRIMERS. "Amplify what? VP62 is synthetic, no one found it." If I spike VP62 into a sample, Mikovits should be able to amplify it using her normal PCR assays (and yes, I know what primers WPI used in the Science study). It doesn't matter if VP62 is synthtetic or if it was flown in by aliens from Mars. Mikovis should be able to amplify it. In fact, Mikovits recently even checked if her positives were not the result of VP62 plasmid contamination. This should show you that even Mikovits believes that her PCR assays would also amplifiy VP62. "Name who has used the same primers as Mikoivts/Ruscetti"
Ah, let's resort to silly quiz questions. Multiple labs have used the same primers as Mikovits used. In fact, her own lab used the same primers in the BWG study. I sure hope she will use the same primers for the Lipkin study. But no matter how close they'll get, if they again come up empty handed, I am sure you can find something that was not done "exactly the same". "The next step is to see if the assay can detect the target in in vivo conditions in a sample taken from a person known to be infected." This step only applies later on in the scientific process, when there actually are persons known to infected. When the hypothesis that is still being tested is whether there actually are persons known to be infected, you can't do this, just as I can't assume that there are "known" craters on the sun's surface when I want to see if there are craters on the sun's surface. Kathy is right. It won't help. Time to move on. Everybody has heard both sides of your arguments ad nauseum. It is a new day and there is a new blog from an honored guest, though if you visit that one, please stay on topic. We are now talking about treatment. >Thank you, thank you. Relief, at last. I hope to never again see the words "assay" or "gel" or anything following "VP." I really appreciate the time and effort you've put into sharing what you know with us. I really appreciate the space you've created here to have a proper conversation about ME and developments in research and understanding. I can't think of anywhere else we can have such a full conversation about ME. >Is this a Guinness World Record we're going for on number of times the same things are said over and over again. I think it's been won by now. Let's wait to say more on Mikovits, Lipkin, Lo, and the NIH until something is said, found, declared or disputed. Let's move on, for the sake of those of us with CFS. I always try to find natural equivalents for prescription drugs, since I have trouble tolerating most prescription drugs. In researching what would be the natural equivalent of Actos, I came across PGX, which does one thing Actos does. It reduces blood sugar spikes after eating. I also came across an herb which does another thing that Actos does. Rats, now I can't remember the name of it. Maybe you could find some other things to substitute for the Actos you have been taking. It has been concerning to see those ads on tv talking about Actos increasing the risk for bladder cancer. >Oh yes, the herb was andrographis. It reduces tumor necrosis factor alpha, which Actos does. "… there definitely is a genetic component to autism, a panel of genetic tests can now pick up somewhere in the range of 15-20% of cases, this may go as high as 30% in the next few years as research on new markers is added." Speaking of urban myths LOL. The figures you quote are fictional. There is ABSOLUTELY NOTHING in published science or clinical medical practice to justify anywhere near those figures. All of those percentages are urban myths, brought about by papers quoting other papers quoting other papers quoting other papers. When one finally gets hold of the original sources – papers that originally came up with 'somewhere in the range of 15-20%' that whole house of card collapses. Read the papers and it becomes clear that percentages are a work of fiction. But do keep hoping. Hope is a good thing. What is another billion to lose on useless research, it is just money after all, so whatever. Keep funding. I see ERV and few smarties on this board now playing with the theory of ME being 'genetic' in origin. Nice. Once you no longer can ignore a disease (too much publicity, hey), best to proclaim it genetic. Nothing that can be done. Nothing to treat. God forbid anyone needs to take any action. Bums firmly on seats and now lets all look for those sneaky ME/CFS genes, can we have a couple of million $$ to get us started please. Here we go.